Nearly twenty years ago, Lester Culver, owner of the famed Culver Circus, was lost with his family in the African jungle. His business partners, brothers Tom and Bernie McGraw, now run the circus–and also manage a trust fund of over half a million dollars, which will pass into their possession in another year’s time if no Culver heir comes forward to claim it. Rumors of a white queen ruling a lost tribe in Africa’s remote Namu Valley lead Tom McGraw (Stephen Carr) to believe that Culver’s daughter Ruth might still be alive, but Bernie (I. Stanford Jolley) is determined to keep the Culver inheritance for himself, and murders Tom when his brother tries to organize a safari to find Ruth. However, before dying, Tom passes on the task of locating Ruth Culver to his trusted friend and employee Congo Bill (Don McGuire), a renowned trapper and trainer of wild animals. Bill journeys to Africa in search of Lureen (Cleo Moore), the mysterious white queen–and is promptly targeted by sinister local trader Andre Bocar (Leonard Penn), who’s not only been paid by Bernie to eliminate Bill but has also been smuggling gold out of the Namu Valley with the lost tribe’s witch-doctor Nagu (Frank Lackteen). To succeed in his search for the missing heiress, Bill must deal with Bernie, Bocar and his smuggling gang, Nagu and his tribal warriors, and the opportunistic Kleeg (Charles King), proprietor of a tavern called the Green Parrot; in his struggles with these multiple antagonists, he receives valuable aid from his native assistant Kahla (Neyle Morrow), an enigmatic stranger named Cameron (Jack Ingram), and–eventually–Lureen, who does indeed turn out to be the long-lost Ruth Culver. Congo Bill was originally a backup feature in Action Comics, its title and general theme obviously “inspired” by the newspaper comic-strip Jungle Jim; thus, it seems rather fitting that Sam Katzman’s movie-serial version of Congo Bill should utilize the same plot setup as Universal’s earlier serial adaptation of Jungle Jim: both chapterplays deal with the adventures of an explorer who takes over a safari for a murdered friend, travels to an isolated jungle realm in search of a long-lost heiress, tangles with greedy would-be heirs and local criminals, and is helped by an undercover government agent. However, Congo Bill’s writers (Arthur Hoerl, George Plympton, and Lewis Clay) do a much poorer job of developing this basic situation than Jungle Jim’s scripting team did. 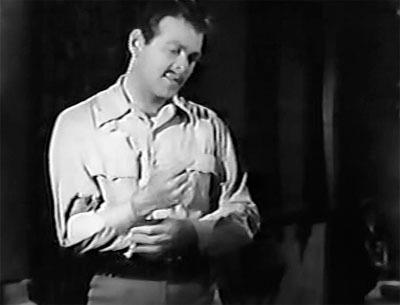 In Jim, the hero spent the bulk of the chapterplay trying to help the heroine escape the jungle and reach civilization, after convincing her of his trustworthiness at considerable risk to himself; Congo Bill, on the other hand, not only wins Lureen’s trust in the space of a single scene, but also experiences very little difficulty in regularly getting in and out of the “hidden” valley of Namu over the course of the serial. 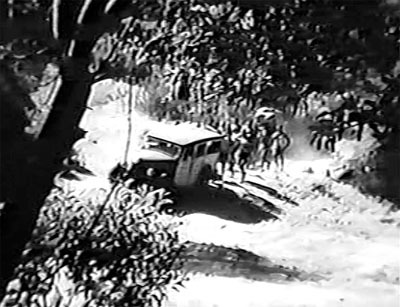 In fact, all of the serial’s characters travel so frequently and so easily between Namu and the settlement of Icala (often using an automobile for part of the trip) that the Valley is effectively stripped of the mysterious and adventurous aura that an uncharted territory ought to possess. Above: Congo Bill’s safari on the way to the supposedly lost but surprisingly accessible Namu Valley. With the hero’s main goal (locating the heroine and extricating her from the wilds) made so easily achievable, the writers are forced to fall back on a motley assortment of plotting contrivances in order make Congo Bill’s narrative fill the required fifteen chapters. The first two chapters spend far too much time on Bernie McGraw’s successful efforts to remove his brother Tom and his subsequent attempts to eliminate the suspicious Bill (who doesn’t even leave for Africa until Chapter Three), while many of the later chapters are padded out by a struggle over a shipment of stolen gold and by a search for a letter (written by the dying Tom McGraw) that incriminates Bernie. The former subplot is respectable enough (if fairly mundane), but the latter subplot is rather absurd; instead of passing continually from hand to hand (like the similarly coveted missive in Mascot’s King of the Wild), the letter is stolen by Kleeg in Chapter Four, who hides it and then promptly forgets where he’s hidden it. This forgetfulness, which allows the letter to stay hidden till the final chapter, comes off as a really desperate (and ridiculous) method of prolonging the serial’s running time. Above: Charles King tells Armida that he’s lost the all-important letter. Additional narrative prolongation is accomplished by means of the pace-slowing walking scenes so common to Katzman’s serials. Iverson’s Ranch, the Corriganville ranch, and several soundstages provide most of the “jungle” terrain traversed in these sequences; while the ranches are both pleasantly scenic, they’re a bit too sunny and lightly-forested to really look like convincing stretches of central African jungle–and also blend poorly with the much more dark and thickly-foliaged soundstages. 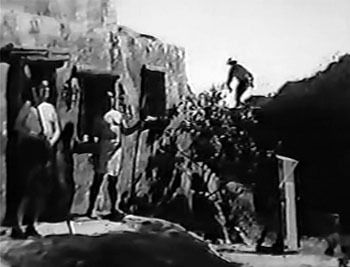 The outdoor Corsican village set at Corriganville (originally built for the Howard Hughes film Vendetta) works rather well as the capital city of the lost tribe, however. 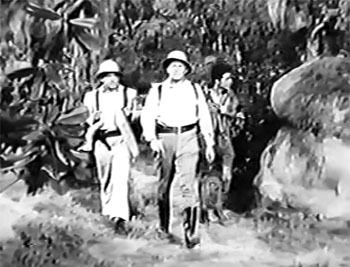 Above left: Anthony Warde, Don McGuire, and Neyle Morrow trudge through the sound-stage jungle. Above right: Don McGuire (silhouetted on the horizon) attempts to surprise two guards in the lost tribe’s city. 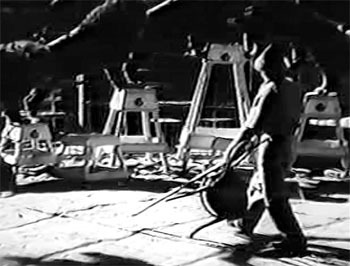 The early scenes taking place at the Culver Circus’s winter quarters were filmed at the Jungleland animal-farm/zoo in Thousand Oaks; one of these scenes features a rare acting appearance by expert animal trainer Melvin Koontz, a sometime Jungleland employee and an important contributor to virtually every jungle serial of the 1930s and 1940s. Playing an aspiring circus lion-tamer called Mel, he puts a quintet of the big cats through their paces in Chapter One; this scene is pure padding (having absolutely no bearing on the plot)–but it’s definitely interesting to see Koontz appear in his own person. The scene also has some amusingly ironic touches that seem to have been intended as deliberate in-jokes; the other characters talk about “Mel’s” lack of lion-taming experience, while Koontz himself asks several comically nervous questions of hero Don McGuire before beginning his act. 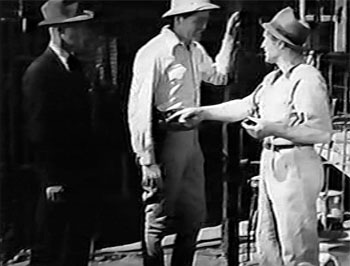 Above, left-hand picture: Melvin Koontz (far right) prepares to enter a lion cage and worriedly urges Don McGuire to keep his gun ready, as Stephen Carr watches. Above, right-hand picture: Koontz proves that he really needs no backup from McGuire or anyone else, easily getting five lions to climb into position. Koontz, of course, doubles for McGuire during the well-done lion-attack sequence in Chapter Six; the lion in the scene is Koontz’s now-elderly cat Jackie, making one of his last screen appearances. 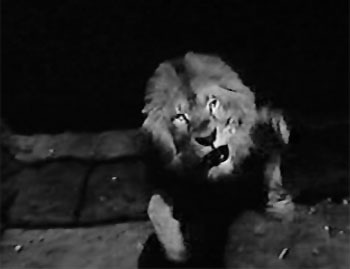 Koontz similarly doubles for the star during the Chapter One scene in which McGuire chases some escaped lions back to their cages, and also handles the stuntwork in the unusually chilling Chapter Four sequence in which Bernie and his henchman Morelli throw a blackmailer to one of the circus lions. 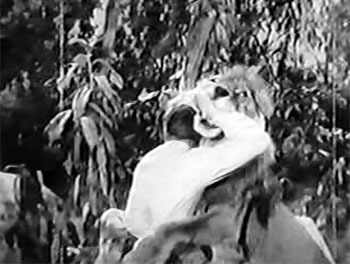 These three scenes are the only ones in the serial in which humans and animals actually battle each other; along with the above-mentioned training scene, some shots of various Jungleland denizens, and a sequence in which Bill and his sidekick Kahla manage to avoid falling into a lion pit, they make up the only new animal footage in Congo Bill. 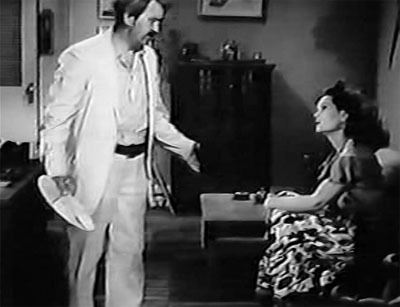 Other wildlife specimens are depicted by means of occasional stock-footage clips, while Ray Corrigan appears as two different gorillas in several scenes–the most memorable of which has him invading a bedroom, smashing through some furniture to get at heroine Cleo Moore, and ferociously throwing heavy Charles King around. 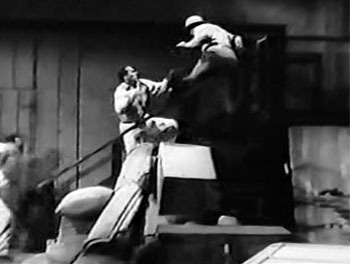 Above left: Melvin Koontz (doubling Don McGuire) and Jackie go at it. 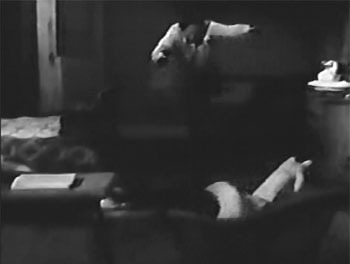 Above right: The rampaging and gorilla-suited Ray Corrigan flings some furniture aside to get at Cleo Moore. 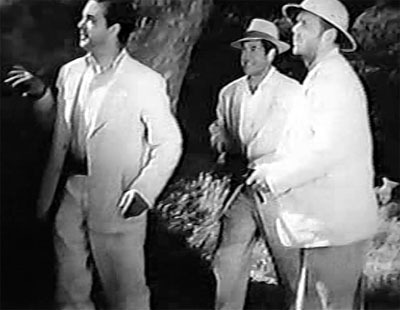 The various fights between humans in Congo Bill are handled very energetically by directors Spencer Bennet and Thomas Carr and by stuntmen Wally West, Eddie Parker, and Fred Graham; however, nearly all of these brawls are too short, typically ending at what would have been the halfway point of one of Carr or Bennet’s Republic fight scenes. The Chapter Two fight in the darkened bedroom, filled with lively leaps, is one of the best of these fight scenes (and one of the longer ones); other highlights include the fight at the campsite in Chapter Five, the battle in Kleeg’s basement in Chapter Nine (which makes good use of a staircase), and the Chapter Fifteen fight at Bocar’s lodge. The periodic arrow/gun battles between heroes (or villains) and natives, and the rarer hero-villain gunfights, are a lot less dynamic than the fistfight scenes–since, as in so many Katzman serials, the combatants either stay rooted to one place for too long, or else endeavor to outflank each other in a plodding fashion obviously intended to pad out scenes; the Chapter Fifteen shootout with Bocar’s gang moves at a particularly slow tempo. Above left: An impressive flying leap from the Chapter Two bedroom fight. Above right: A shot from the fight in the basement in Chapter Nine. Many of Congo Bill’s chapter endings are either weak in concept (the Chapter Ten snare trap, the Chapter Fourteen treasure-chest trap) or too abruptly introduced (the Chapter Four car explosion, the Chapter Six quicksand plunge, the Chapter Twelve knifing). The grinding-gears cliffhanger of Chapter Three is foreshadowed more effectively, as are the Chapter Eleven mill explosion and the Chapter Thirteen gorilla attack; the suspensefully built-up Chapter Seven cliffhanger–which has Kahla trying to break down a door to rescue Bill, unaware that he’ll plunge himself into a lion pit if he succeeds–is also good, if a little illogical; Bill, locked in a closet, keeps yelling to Kahla to stay back, but doesn’t bother to tell him why. The Chapter Eight cliffhanger that has Bill menaced by Kleeg’s intimidating rotating knife-blade device also comes off as logically questionable, despite a decent buildup; it’s simply hard to believe that a small-time crook like Kleeg would possess such a high-tech contraption. 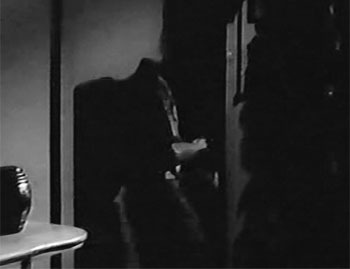 Above left: Neyle Morrow tries to break down a door, unaware that the door will drop him in with the excited lion at above right. Don McGuire, who played major roles in several feature films before becoming a screenwriter and director, is quite good in Congo Bill’s title role, though he suggests a tough big-city private-eye more than a dashing jungle adventurer. He spends much of the serial displaying aggressive suspicion and sarcastic disgust towards the serial’s various shady and hypocritical characters; in lighter moments, he tends to come off as wryly flippant and somewhat cynical. This decidedly hard-boiled performance isn’t one of the serial genre’s more charismatic ones, but it is interesting and often entertaining–particularly when McGuire is reacting to the prevarications of his many villainous co-stars. Cleo Moore makes her screen debut as Lureen; she’d go on to become a fairly well-known B-picture actress and win frequent comparisons to Marilyn Monroe; though she unquestionably looks good in a sarong and delivers her dialogue cheerily and capably, she seems far too casual and modern to be remotely convincing as a primitive queen (it’s hard not to laugh when Knox Manning’s narration refers to her as “inscrutable”). Linda Stirling had similar problems with her jungle-ruler turn in The Tiger Woman, but nevertheless managed to maintain an aloof and queenly dignity of sorts; Moore’s few attempts at displaying regal hauteur come off as mere poutiness. Above: Cleo Moore registers alarm. The supporting cast of Congo Bill is frankly a bit overcrowded; the serial contains so many villains that they practically trip over each other at times, while none of them are ever quite allowed to emerge from the crowd long enough to qualify as the unquestioned central menace. However, the actors playing these assorted heavies are all a lot of fun to watch, even though many of their interactions are obviously designed as mere narrative filler. Leonard Penn is memorably sinister as the smooth and bluntly ruthless Bocar, regularly switching from arrogant suaveness to ferocious anger in abrupt and startling fashion; if the script didn’t sideline him before the showdown in the last chapter, he would definitely have come off as the serial’s most formidable heavy, despite plenty of competition. Above: Leonard Penn (right) enlists the assistance of Charles King. As the easygoing schemer Kleeg, Charles King uses a soft and insinuating drawl, an amusingly sloppy appearance, and a comically sly and obsequious manner to steal almost every scene he appears in–whether he’s delivering unctuous and long-winded greetings to his bar customers or proclaiming his innocence and trustworthiness to various disbelieving listeners. As Bernie McGraw, I. Stanford Jolley has less screen time than Penn and King, but makes the most of his part, affecting a slimily polite demeanor that regularly gives way to snappish irritability whenever his impatiently greedy character is interfered with. 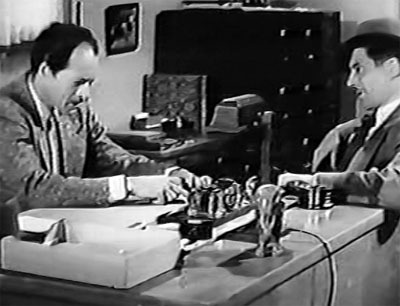 Above: I. Stanford Jolley (left) plots with Hugh Prosser. As Bernie’s henchman Morelli, Hugh Prosser turns in a calmly businesslike performance that–when combined with his character’s many murderous actions–comes off as rather frighteningly cold-blooded. Anthony Warde heads up Leonard Penn’s henchman squad; though relegated to the background for much of the serial, he gets a couple of good opportunities to surlily snarl back at the sneeringly peremptory Penn; his thuggish smugness after gunning down a native and his vicious threatening of Charles King also give him a chance to display his usual screen personality. Fred Graham is swaggeringly confident as another of Penn’s henchmen, while Rusty Westcoatt (as the other principal recurring member of the Bocar gang) turns in an offbeat but amusing comic performance–delivering his lines in an exaggeratedly halting growl, staring blankly and uncomprehendingly into space, and generally coming off as a cartoonish spoof of a standard dull-witted thug. 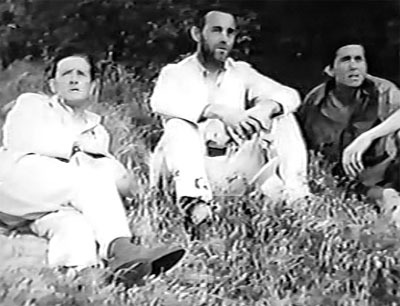 Above, left to right: Anthony Warde, Fred Graham, and Rusty Westcoatt. The scrawny but energetic Neyle Morrow is very likable as the hero’s resourceful and cheerful native sidekick Kahla, although appearances by several black bit players as native bearers make one wonder just what continent the swarthy but definitely Caucasian Morrow is supposed to be a native of (perhaps his character is one of the Indians who emigrated to East Africa, though that doesn’t explain his use of the word “bwana”). Jack Ingram plays against type quite well as the secretive but dependable Cameron, maintaining a coolly enigmatic air but also managing to seem quite good-humored in his interactions with the other good guys; his almost jaunty affability and Morrow’s pleasant eagerness help to counterbalance McGuire’s general gruffness. Nelson Leigh is excellent but underused as the somber Dr. Greenway, who sporadically helps the good guys; his dignified but melancholy demeanor and a few hints in the script suggest that his character is a once-respectable physician who’s had a sad comedown and is trying to regain his self-respect–but this intriguing angle is left largely unexplored. Above, left to right: Jack Ingram, Nelson Leigh, and Neyle Morrow. Frank Lackteen is as menacing and entertaining as ever in his periodic appearances as the conniving witch-doctor; his subtle but emphatic changes of expression (from annoyance to evil delight to anger) during his Chapter Nine argument with Cleo Moore are particularly enjoyable. As Lackteen’s cohort (and the lost tribe’s head warrior), Stanley Price delivers a couple of fanatical speeches with his accustomed feverishness, and flashes some characteristically deranged-looking smiles when carrying out ambushes. The other members of the lost tribe of the Nagu Valley are played by producer Katzman’s usual stock company of Samoan extras; no real explanation is given for their existence in the middle of Africa, but their alienness is at least noted by the screenplay (instead of being simply ignored, like the presence of the light-skinned “natives” in the later Katzman serial King of the Congo). 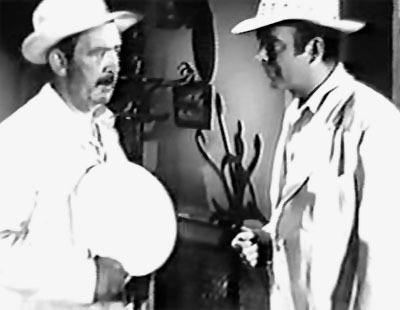 Above: Frank Lackteen (right) plots with Stanley Price. 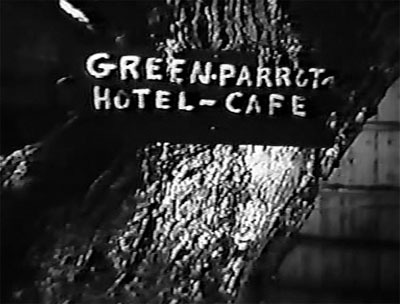 Mexican actress and dancer Armida, once a vaudeville star (and a would-be movie star), poses another ethnographic riddle as the Spanish-speaking barmaid of the Green Parrot; though no explanation is given of her origins, her energetically talkative character plays well and amusingly off of King’s grumblingly laid-back Kleeg in their occasional scenes together. Stephen Carr, the brother of co-director Thomas Carr, delivers a very flat performance as the unfortunate Tom McGraw, although his listlessness helps him make his lines sound properly weak and lifeless during his protracted death-bed scene. William Fawcett has one scene as a toothless and colorful old jungle bum, stuntmen Eddie Parker and Wally West pop up briefly as (respectively) one of Kleeg’s thugs and a stateside henchman of Bernie McGraw’s, and Frank O’Connor has the small recurring role of Kleeg’s bartender. The youngish and smugly confident actor who plays the medical-attendant-turned-blackmailer in Chapters Two and Four is unfamiliar (at least to me), as is the dignified doctor who appears in Chapter Two. Overall, Congo Bill simply doesn’t have enough distinctive or outstanding qualities to dispel the general sense of tedium arising from its slow pace and its lack of real jungle-adventure atmosphere. A solid cast and some good outbursts of action make the chapterplay watchable enough, but it nevertheless ranks as one of the more thoroughly mediocre outings from the 1948-1953 Bennet/Katzman era of Columbia serial-making. This entry was tagged Anthony Warde, Charles King, Columbia serials, Frank Lackteen, I. Stanford Jolley, Jack Ingram, Leonard Penn, Sam Katzman, Spencer Bennet, Stanley Price, William Fawcett. Bookmark the permalink. I heard so many bad things about CONGO BILL, that when I started it, I did so with trepidation. I thought it was better than I expected, and did like it. I guess I’m easy to please. I also liked this serial and thought Don McGuire’s acting better than most serial heroes. Charles King was a hoot reprising his character from JUNGLE RAIDERS, complete with fan. One thing that I noticed was that McGuire’s arms seemed unnaturally long, especially as he swung them back and forth when running. Not that the length of an actor’s arms should matter, it just seemed strange, and perhaps a little comical. *** out of ***** I also found this one entertaining despite its flaws. McGuire was an okay hero. Moore filled out her sarong well although seeming too much a girl-next-door type to be a jungle princess. Charles King was a hoot and gave the serial a big lift whenever he was on screen. Forgetting where he put the letter? Us old guys might find that less of a stretch than you younger fellows. *I also noticed McGuire’s odd running style. Did not care for this serial as a child but watched it recently on DVD and enjoyed it very much, Actors were good, plot was somewhat weak but overall have seen many serials worse than Congo Bill this one has gotten better with age, would recommend this to any serial fan but I am easy to please when it comes to serials.